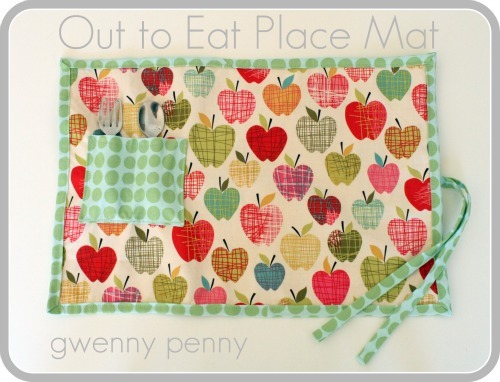 A little while back Jaime spotted this brilliant Out to Eat Place Mat tutorial by Gwenny Penny. Not only does it hold toddler-sized utensils, but it rolls right up and can be tossed in the wash for easy cleaning. So long germ-infested table tops and baby spoons lost in the dreaded diaper bag abyss. Over at Gwenny Penny you can find great tutorials that would make the best holiday gifts. 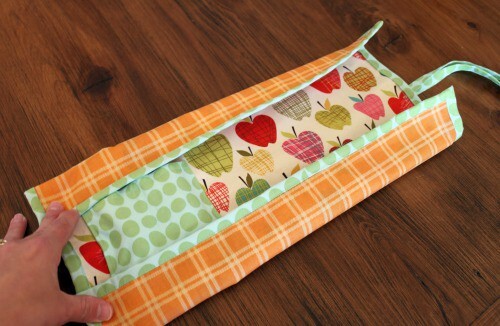 Sew a Pencil Pouch for a stocking stuffer and a Little People Applique Tote Bag for a gift. The Thanksgiving Embroidery Hoop Turkeys are just what my house needs. Hey, everybody! I’m Gwen, and I blog over at Gwenny Penny. 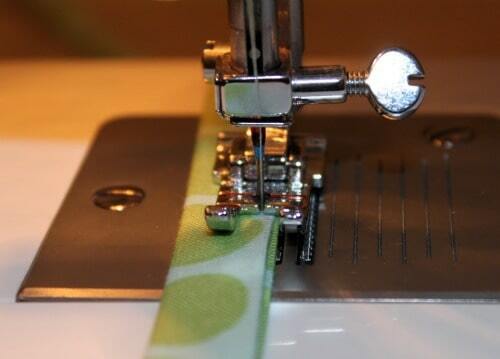 I love to sew, and today I’m going to share a sewing tutorial for an ìOut to Eat Place Matî. When my girls were little, I was guilty of feeding them their finger food right on the table at restaurants. Gross? Yes… have you seen them wipe down the tables before? I decided to make a place mat that I could easily tuck in my bag to bring with us when we went out to a restaurant. I included a little pocket to hold some toddler-sized silverware and ties to wrap the entire place mat up into a compact little roll. Step 1: Cut out all of your fabric to the dimensions listed in the materials list above. 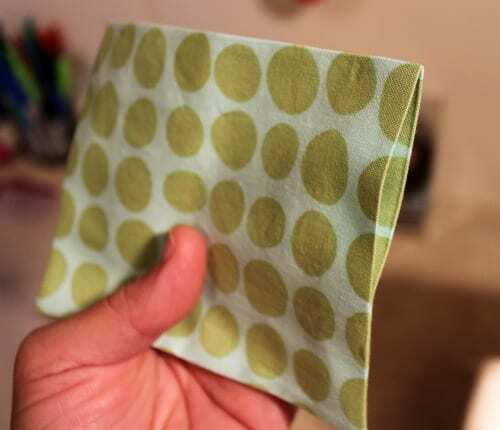 Center your fusible interfacing on the wrong side of the fabric you are using for the front of your place mat, and iron it in place following the manufacturer’s directions. 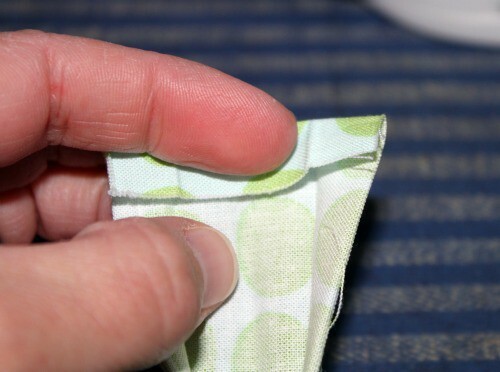 Step 2: Next you need to prepare the pocket. 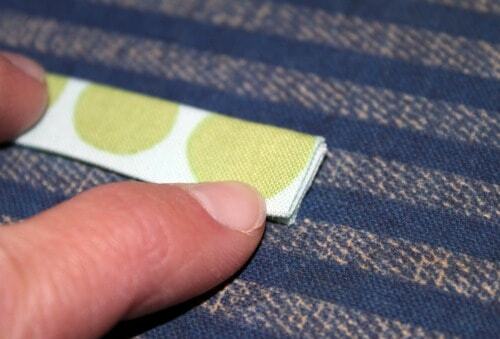 Take your pocket fabric and fold it in half (bringing the shorter sides together) with right sides together. 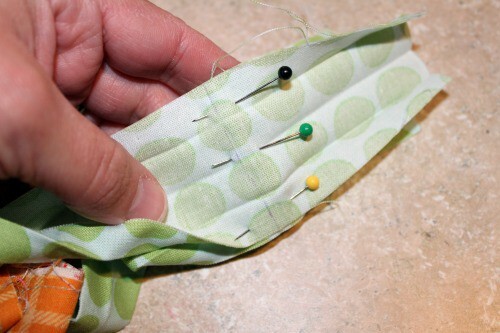 Sew around the three open sides, using a 1/2″ seam allowance and leaving a 2″ opening for turning. 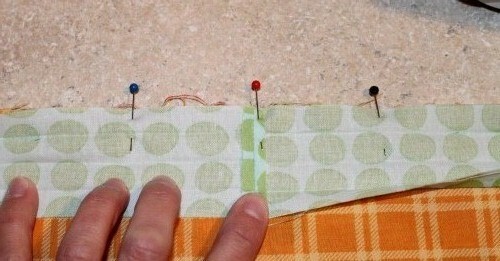 Clip the corners, trim the seams down, and turn the pocket right side out. Press the pocket, making sure to tuck the edges of the opening inside the pocket. 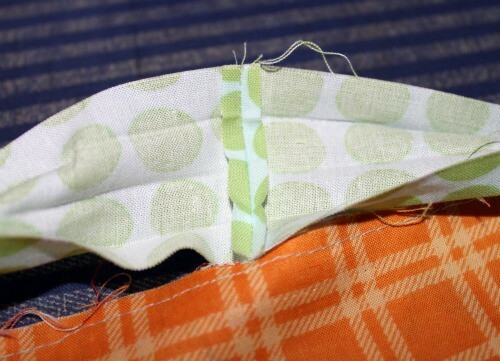 Step 3: Sew across the top of the pocket (the folded edge) about a 1/4″ from the top edge. Step 4: Mark the center of the pocket by drawing a line from top to bottom (I used a water soluble disappearing ink pen). 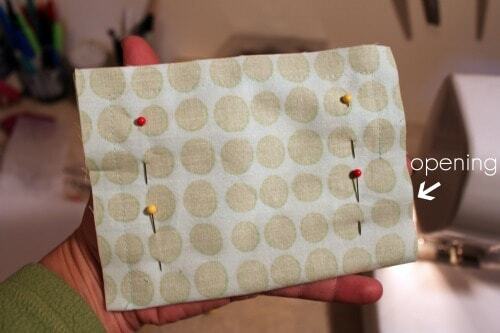 Pin the pocket in place on the front of your place mat. The top of the pocket should be 4″ down from the top of the place mat, and the left side of the pocket should be 1.5″ from the left edge of the place mat. 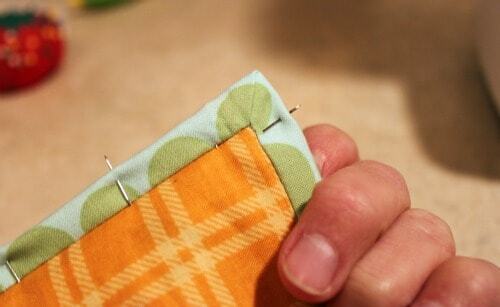 Sew around the left, bottom, and right sides of the pocket (1/4″ from edges), then sew along the line you drew down the center of the pocket. 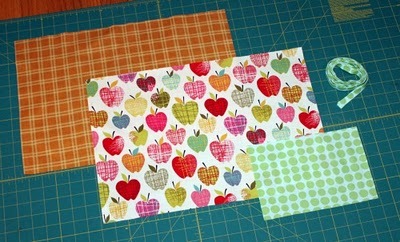 Step 5: Take your front and back pieces of place mat fabric and line them up with wrong sides together. 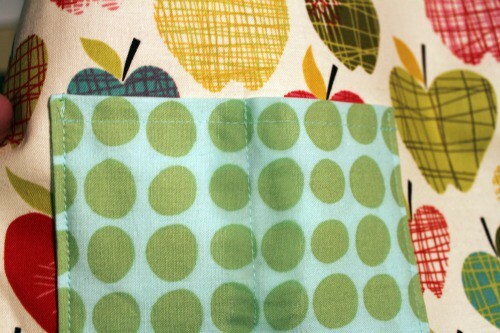 Baste (using a very long running stitch) all around the outside edges using a 1/8″-1/4″ seam allowance. 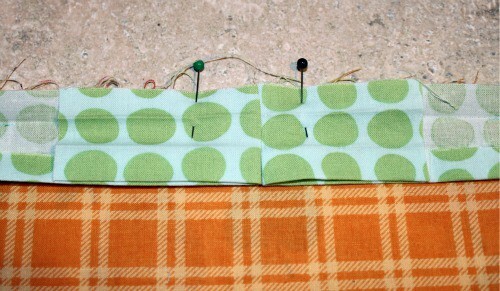 Step 6: Make sure you reset your machine to a shorter stitch length. 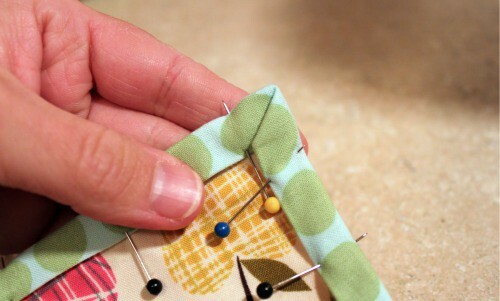 Before you sew on the binding, you can make some little ties to add to the place mat so that you can roll it up. Cut a piece of bias tape that is 24″ long. Open up one end of the bias tape. Fold in the end about 1/4″. Refold the bias tape. Repeat on the other end. 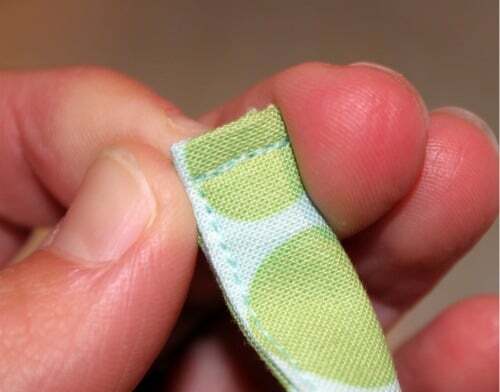 Sew the ends and length of the bias tape closed by sewing very close to the edge. Set this piece aside. Step 7: Time to bind your place mat. Take your bias tape and open it up. Starting along the bottom edge of the back of the place mat, pin one edge of your open bias tape even with the raw edge of the place mat. Leave about a 6″ tail of bias tape at the very beginning. 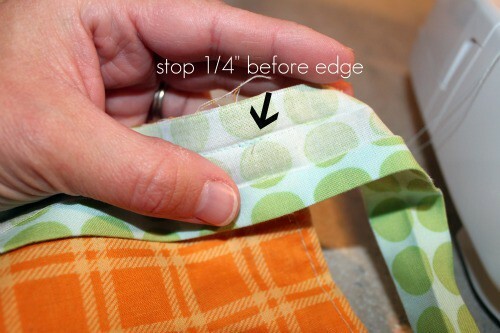 Sew right in the crease of your bias tape that is closest to the outside edge of the place mat. 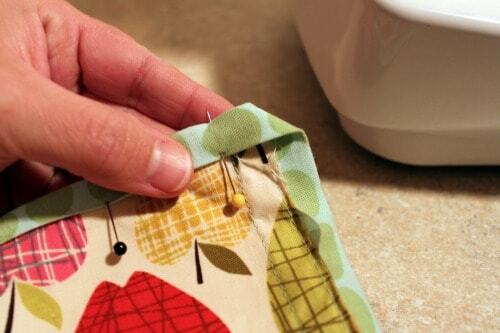 Stop sewing and backstitch 1/4″ before you reach the edge of the adjacent side of the place mat. 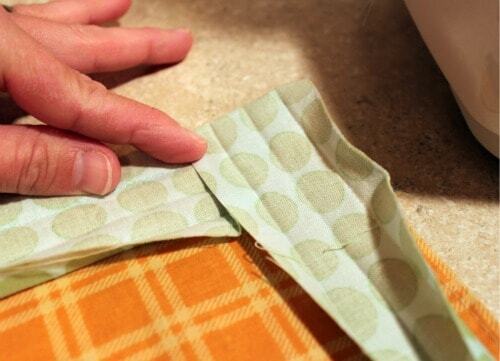 Fold your bias tape up at a 90 degree angle. Fold the bias tape back down over itself. 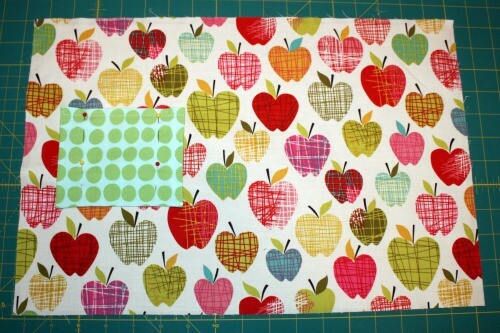 Start pinning the bias tape along this side, even with the raw edge of the place mat. Step 8: If you are now at the side of the place mat opposite the side with the pocket, you need to attach the ties you made earlier. 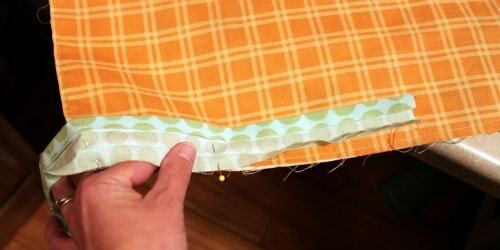 Fold the 24″ piece of bias tape in half and slip the folded edge under the bias tape you are attaching around the place mat, centering the ties on the side of the place mat. Step 9: Start sewing in the outermost crease of the bias tape again, starting 1/4″ from the edge of the place mat and stopping 1/4″ from the opposite end. Repeat the folding from Step 7 for all four corners. Stitch back and forth over the tie attachment a few times. Step 10: When you get all four corners done, continue sewing the bias tape along the bottom of the place mat, stopping when you are about 6″ from where you started attaching your bias tape. 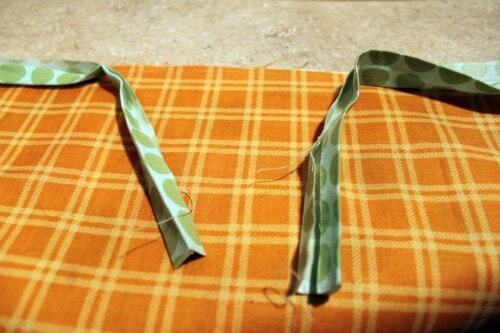 Step 11: Fold over each tail of your bias tape so that they touch in the center. Pin in place and finger press. 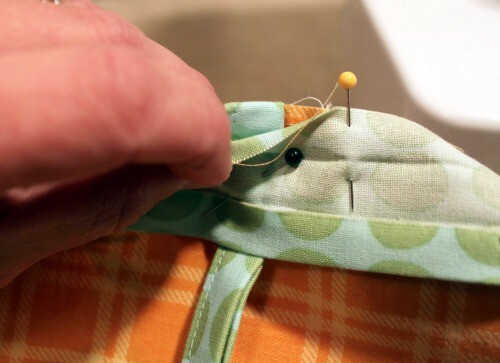 Remove the pins and match up the creases you just made with right sides together. Pin. 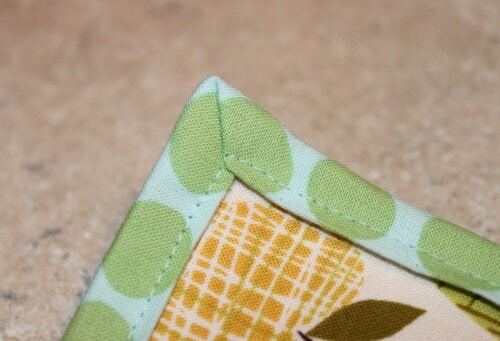 Sew across the crease you just made (I lightly marked it with a pen in the photo above). Trim the seam to 1/4″, and press the seam open. 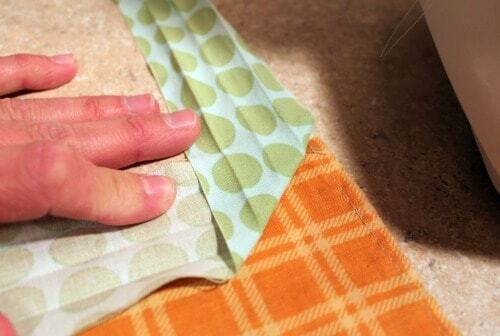 Step 12: Line up the edge of the bias tape along the raw edge of the place mat. 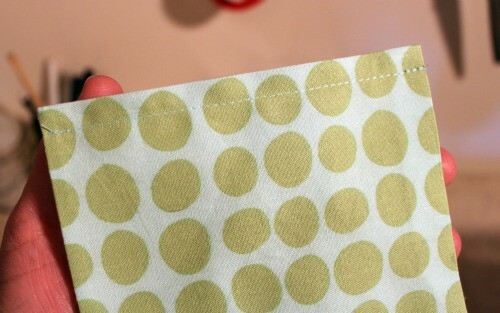 Finish attaching the bias tape by sewing in the outermost crease of the bias tape again. Step 13: Now that your bias tape is attached all the way around the outside, it’s time to fold it over to the front of your place mat. 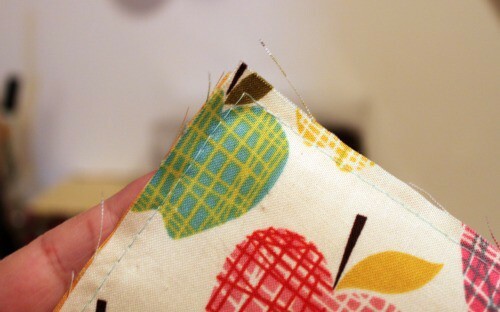 Refold the bias tape and pull it over the edge of the place mat to the front so that it just covers your stitches. 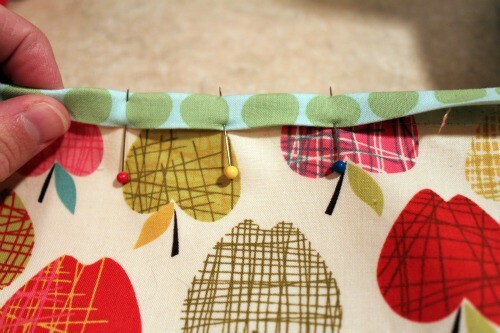 I use LOTS of pins to hold bias tape in place. Carefully miter each corner. It may take a few tries to get it right. You’re all done! Now insert some silverware, fold the top and bottom edges toward the center, roll it up, and tie it. 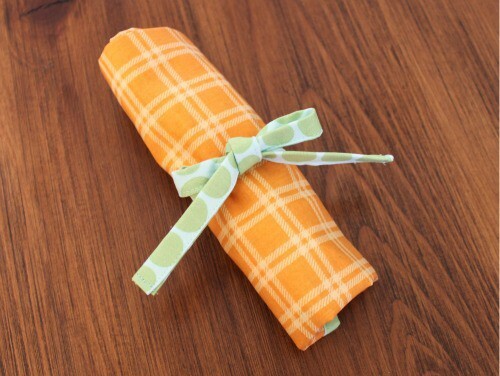 Now you have a cute little place mat to bring with you to the restaurant for your little one, and you don’t have to worry about what was on the table before you sat down with your family. Cover that place mat with Goldfish crackers and enjoy! Thanks so much to the Prudent Baby ladies for having me here today. I hope you’ll stop by Gwenny Penny and say hello. While you’re sewing up the Out to Eat Place Mat, check out the Ric Rac Place Mats for the home and the Playtime Place Mats for the kids. 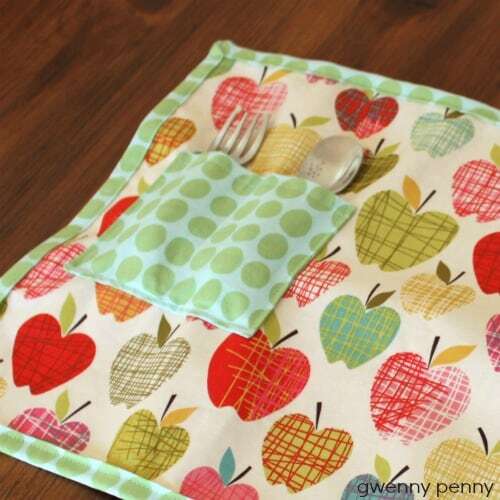 Thanks so much for sharing my place mat tutorial! This is wonderful! 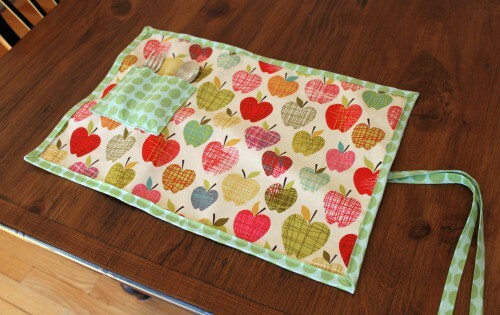 I plan to make one for my little guy who is 18 months old and one for his sister, who at four uses regular utensils but would love a mat to eat on at “out of home” locations! I may make her pocket a bit smaller and to the left more and place a germ-x bottle in it! I also have some iron-on vinyl left from another project that would work great to make it wipe clean so it doesn’t have to go in the wash quite so often.